I have a tshirt that says “happiness is bicycle shaped”. Today more than any other day of the ride this rang true. 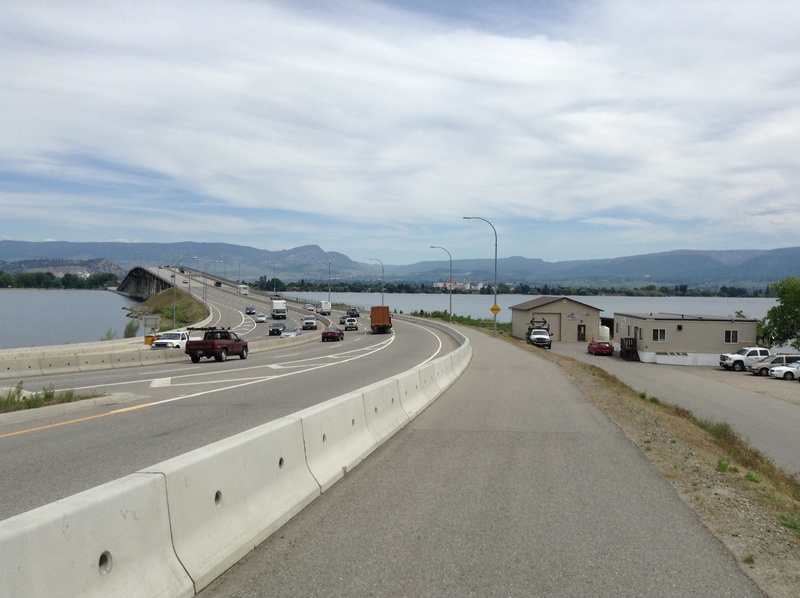 Today I cycled 73km along the rugged western shore of Lake Okanagan. The Okanagan area really reminds me of the south of France. I cycled under a hot egg-blue sky, the lake to my right, dusty rocky hills on the left. The Okanagan region is known for its wineries (it’s where Canadian ice wine comes from). 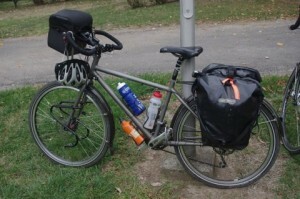 With only 70km to do all day I was able to cycle at a leisurely holiday pace. 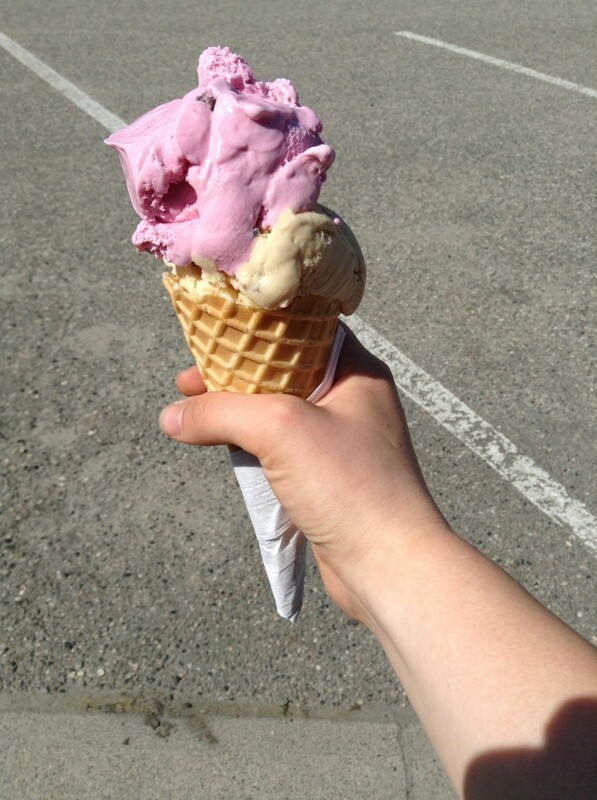 After 20km I mounted a steep hill and treated myself to a gargantuan icecream. Nom. 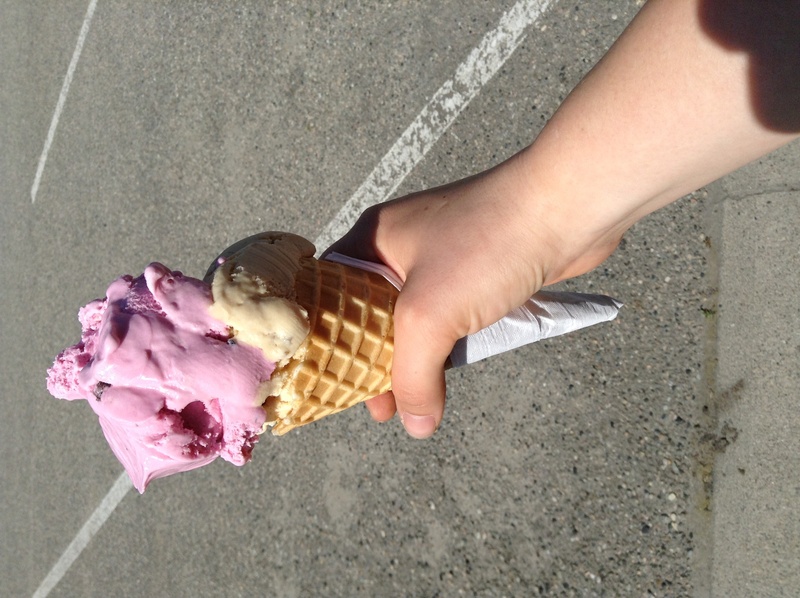 Scoop 1: maple walnut. Scoop 2: black cherry. 20km later I didn’t think twice about zooming down a short hill to check one of the wineries. Having cycled in the heat for a couple of hours the refined sips of wine disappeared in thirsty gulps. “Hmm… Yes you can really taste the notes of pear and citrus,” I commented while downing the glass in one. Trying to come across sophisticated while wearing Lycra and bike clothes is not an easy task. All the wines were delicious (aren’t all wines delicious after cycling in the sun?) so I bought a bottle for the family who are hosting me in Kelowna. 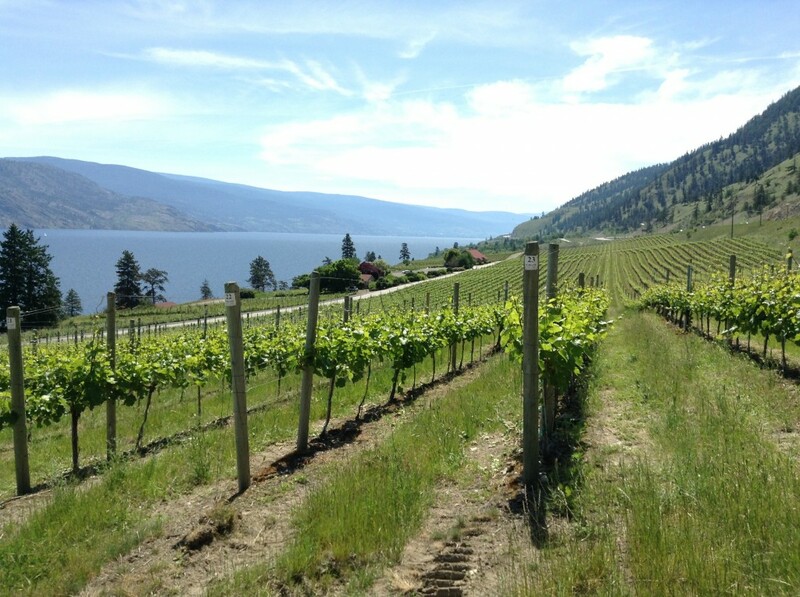 I heard on the grapevine that the Okanagan region produces some fine wine. Groan. After catching up over a cold glass of water, Courtney and I headed down to the bike shop. She has recently got a shiny new Surly disc trucker in preparation for her Canada trip which she needed to pick up for its first service. I wheeled Monty along as I have recently been developing paranoia that Monty’s brakes are wearing down and that the tyres are about to perish. My brake paranoia is perhaps justified as the brakes have had to cope with lengthy hairpin snaking descents in France and a nerve-shattering 25% descent into Lynmouth last summer. “You have about 10% wear on those brakes,” the bike mechanic commented. My jaw clunked like an unoiled gear change as it fell to the floor. “Disc brakes last a lot longer,” he added as way of explanation. “It’s a Roberts.” I explained, not thinking they would have heard about Roberts. But they had. Another guy came over to inspect Monty. I got the impression that, despite the guys’ too-cool-for-school nonchalance, Monty’s arrival in this small Kelowna bike shop was an equivalent spectacle to a Wandering Albatross swooping over Bedfordshire. Turns out that not only are Monty’s brakes totally fine but so too is his tyre beading. “I know a guy,” the mechanic explained, “who cycled across Canada and back on Schwalbe marathon tyres. He didn’t even get one flat. 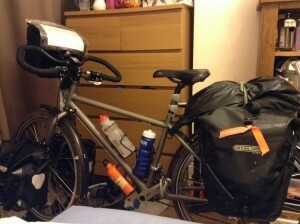 You have Schwalbe Marathon Plus tyres.” My paranoia abated. Monty smiled coyly, flattered by the attention and admiration. I am so happy the way my trip is taking shape. Possibly I am the happiest that I have ever been in my life. And so is Monty because he is doing what he was built to do. It’s true what the tshirt says: happiness is bicycle shaped. Bikes have wheels not wings – they are not designed to fly. I was greatly relieved then to see his shiny wheels appear on the oversized baggage pick up in Vancouver airport. Phew. However, my relief however didn’t last too long. Two friendly Canadian cyclists, John and Margaret, came to bike me up at the airport. Despite having never met, John was easy to spot because he was the only man at the airport wearing cleats. John and Margaret helped me unwrap Monty, slicing off the cable ties and padding, pumping the tyres and reattaching his wheels. The first time Monty got scratched I freaked out. He was scratched, incidentally, by travelling by train. (There’s a pattern emerging here..) but this time although the damage was much worse I was calm and already thinking of the solution. The solution appeared after lunch. John and I rode to the local bike shop and explained the “emergency”. The guys in the bike shop were thankfully not too busy and able to attend to Monty right away. 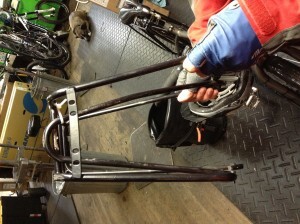 The rack was beyond repair (or at least beyond repair given it has 25kg to carry for 3 months!) so a new rack was in order. 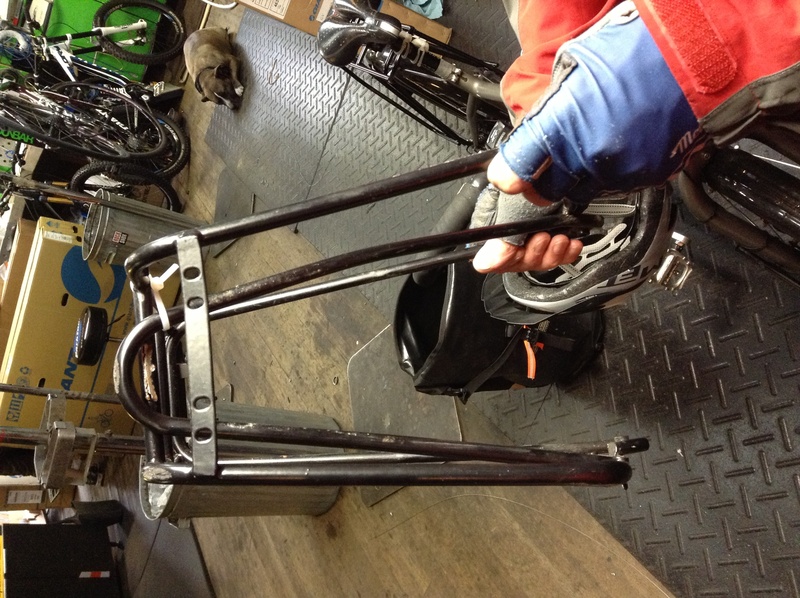 “Wow, that’s a high end rack,” one of the mechanics commented while hunting around for a suitable replacement. Thankfully they had one Tubus rack in stock. About an hour of fixing later (which included bending the mudguard back into shape) and I parted with $150 before wheeling Monty out. 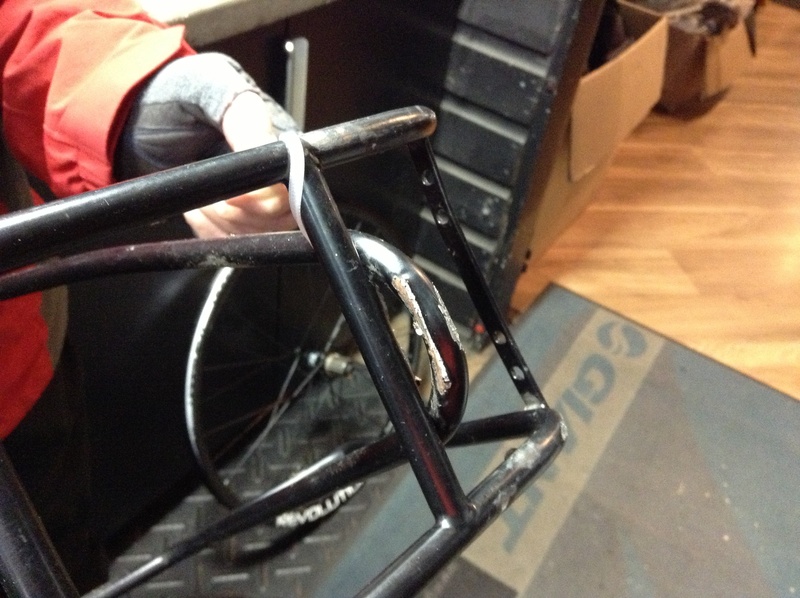 Yep, it wasn’t cheap and indeed Monty’s mudguard is now partially affixed by cable ties which looks a bit naff. Monty’s big bash has made me realise how much I will need to be careful about looking after him on the road. But now he’s fixed he’s really for a more metaphorically kind of big bash- namely the adventure of a lifetime! 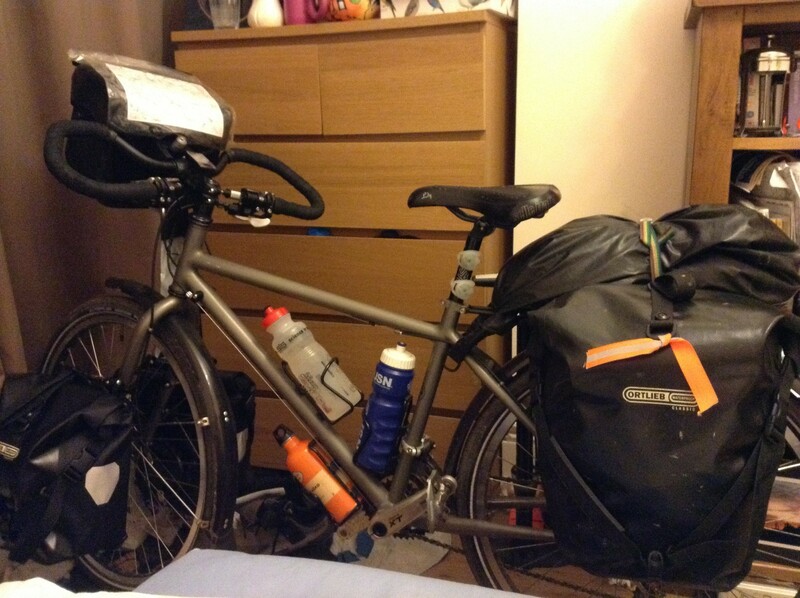 “I’m just going on a bike ride, eh?” I said to my Dad, trying to play down the epic-ness of my adventure, When 7,500km are stretched out ahead of you it makes sense to focus on what is achievable and fun: going on a bike ride. Yesterday evening I gave a small whoop of glee: I’m packed. After 8 years of dreaming, 3 years of saving, 5 months of planning and a packing process that I started sometime in mid-March. Yep, I am finally packed and ready to go. I spent the last dregs of Sunday evening flipping through an Atlas and looking through an old book of Canadian photography. I couldn’t get to sleep. My head felt inside out. My dreams were so vivid they seemed like wakefulness and I jolted myself awake several times. I woke at about 4am with my head feeling like a mashed banana. My Dad drove me to the airport. Getting up at 4am to drive me to the airport is probably not his ideal Bank holiday birthday (yes,it’s his birthday today) but I am very grateful. Thankfully Monty and my large, shabby looking bag of pannier bags made it okay through check in. Monty didn’t much enjoy being wheeled around the airport as some of corridors and lifts were only 2mm wider than him. Poor thing felt like a fat person in a cubicle toilet. Thank goodness I am not flying Cattle Market. The Air Transat check in was a yoga retreat of calm compared to the noisy, crowds hordes queuing lengthily at the Easy Jet counter. I hugged my Dad goodbye. I nearly felt tearful but my banana brain can’t quite comprehend what is about to happen. Generous folks have called my brave. Canada is a huge country but it is not the size of my courage. I have only the Courage to Dream. Then I have the Credit Card to Pay. And once the credit card has paid (for non-refundable, non-transferable flights) then I do not need courage any more. The pieces of my trip in the last 5 months have fallen like dominoes. The click of my computer mouse was the first push that set my trip in motion. one by one the tasks were lined up and fell in turn. Flights lead to insurance, bear research, friend contacting, route planning, cycle training, back stretching, blogging, tweeting, kit testing, new kit purchasing, and finally packing. At the moment I am trying to imagine that I’m only cycling as far as Lake Louise. Because 4,500 miles across the second large country on earth seems a tad far, eh? Whereas a 2 week jaunt through BC sounds like quite a jolly summer holiday. After all, I’m just going on a bike ride, eh?